Review "What Makes Us Human: Choosing to Create Life". 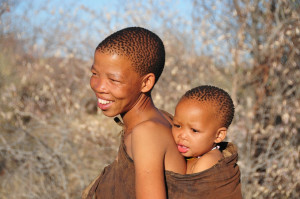 On the Gail Ingis, ASID website, under the title Clicky Words, Inglis describes visits to the Khoisan hunter-gatherers. She says: "Motherhood, in Khoisan culture Bushmen, brings status and social recognition to the woman after she has navigated the journey of pregnancy and birth..."
"Bringing a child into the world is a gift to the tribe and a young mother is taught that how she feels and thinks during the pregnancy will affect the labor and birth of the new baby. Other members of the group will assist by helping to carry other children or food. A pregnant woman is expected to continue with her normal duties such as gathering food, cleaning, caring for other children and should not complain. This renders a woman fit and healthy during her pregnancy – there is no room for slothfulness or overeating in this society. A pregnant woman is rarely overweight and an unborn baby is likely to grow to be the right size for the mother to give birth. See and read more on the Inglis website.